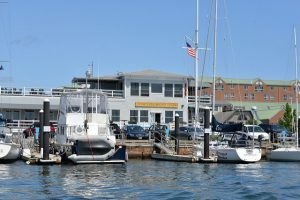 Aquidneck Island communities (Middletown, Newport, and Portsmouth, including Naval Station Newport) are impacted by coastal hazards such as flooding from strong storms, periodic extreme tides, and, in some areas, daily high tides. Sea level rise and climate change are exacerbating these impacts. The Aquidneck Island Resilience Strategy (AIRS) highlights key issues and provides science- and citizen-informed recommendations for the future. The strategy, created in collaboration with the Aquidneck Island Planning Commission together with municipal and regional leaders, builds on municipal strengths and proposes Island-wide, collaborative actions. AIRS target four key focus areas: Emergency response and preparedness, Transportation, Island economy, and Residential flooding. Share what leaders and key community stakeholders see as their most significant concerns as well as what they are doing already. Inform the people in the island community of the current and future coastal threats. Provide recommendations to promote their ability to deal with these disturbances while maintaining their community systems’ many different functions. Beyond the specific recommendations included in the strategy, it is strongly recommended that the practice of seeking out opportunities to work together at the municipal level be continued and expanded. Emergency response and preparedness. Concerns addressed: bridge closures during extreme weather, vulnerable populations, disruptive storm impacts (e.g. flooding, downed trees), and public awareness regarding preparatory actions. Transportation. Concerns addressed: bridge closures during extreme weather, present-day roadway flooding and erosion, impacts of flooding on road and bridge foundations, collaborative road maintenance, congestion, and impact of transportation disruption on economy. Island economy. Concerns addressed: disruption of local businesses during storms, government-community-business partnerships to protect the economy during emergencies, regional impacts of environmental hazards. Residential flooding. Concerns addressed: present-day flooding due to extreme high tides, balancing coastal adaptation in historic neighborhoods, flood insurance, aging stormwater infrastructure and associated flooding. BeachSAMP website. The Rhode Island Shoreline Change Special Area Management Plan explains how flooding and erosion is shaping the coast. This webpage offers updates of this ongoing project as well as related tools and projects. STORMTOOLS webpage. This interactive mapping tool displays storm inundation for a range of sea level predictions and storms that could occur along Rhode Island’s coast. Aquidneck Island Special Area Management Plan. A state-administered plan for the management, use, and protection of coastal and ocean resources that anchor the island’s economic, social, and environmental health. CRC was a main collaborator on the project.